Relax and explore the water and skyline views of Baltimore with this unique package! The lunch/dinner cruise is a 2 - 3 hour experience which is the perfect way to wrap up your experience after floating through the sky over Baltimore. Meet us at our helipad at Pier 7 in Canton. We offer free parking, or you may opt to take the Water Taxi from the Inner Harbor (seasonal) to the Pier. 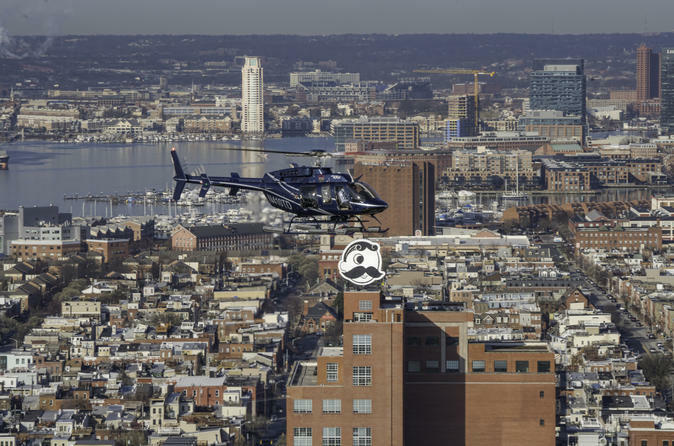 Choose from various flight times and enjoy aerial views of downtown Baltimore and spectacular views of the Inner Harbor, Historic Fells Point, Oriole Park at Camden Yards and Ravens Stadium, Johns Hopkins Hospital, Mount Vernon (Baltimore), the iconic Domino Sugar factory, Natty Boh Tower, Patterson Park, aerial views of the 160+ year old USS Constellation and USS Torsk, and of course, the Chesapeake Bay. On departure and arrival over the Northwest Harbor, you will have the best view of Fort McHenry from a bird’s eye view, original location of the Star Spangled Banner. Your Pilot, who has been trained by local historians, will narrate the entire tour.